The Cathedral of Notre Dame is one of the most famous churches in the world, due in large part to Victor Hugo's creature that roamed it at night in The Hunchback of Notre Dame. 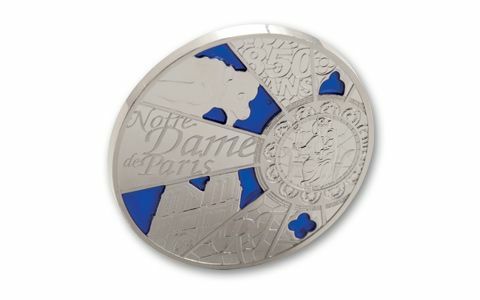 This 2013 French 10 Euro Silver Notre Dame Enamel Proof celebrates its 850th anniversary. The Proof features the rose window with the virgin and child and two of the famous gargoyles, with the background filled in with blue enamel that the light shines through! It was struck in 21-grams of 90% proof silver just across the river from the church at the world-renowned Monnaie de Paris - the Paris Mint. Hurry! Only 10,000 were minted.